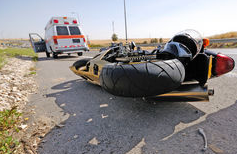 Motorcycle accidents can be devastating and, oftentimes, fatal. With no barriers between the rider and the road or another vehicle, accidents tend to cause severe injuries. To make matters worse, motorcycles are less visible to other cars and trucks and are easily hidden by other objects on the road. Collisions, debris, uneven road surfaces and even wet pavement can cause a motorcycle to crash. At Waitz & Downer, we want you to be prepared in the event of an accident. Unlike typical auto accidents, motorcycle accidents are typically far more dangerous. If you are involved in a motorcycle accident, the actions you take immediately after the incident and in the days that follow will have a significant impact on the outcome of your case. Check for injuries. Make sure that everyone is okay. Call for help. Even if there are no visible signs of injury, you may have internal injuries that need treatment. You also want to make sure that a police report is filed at the scene. Take photos of the accident and any injuries that you may have sustained. If possible, take the photos before you leave the scene unless immediate medical attention is required. Get the contact information of any witnesses that saw the accident. Document the accident. Write down every detail you can remember about the accident. What time was it? What was the weather like? What happened? Write down anything that you can remember. Document all damages, injuries and medical treatments. In addition to medical treatment, you should also keep a log of your pain, injuries or any emotional distress the accident has caused you. Most motorcycle accidents are governed by negligence laws. In many cases, the driver of the vehicle is considered the negligent party. They may have sped through a red light, or failed to check their mirrors thoroughly before making a turn. In some cases, the rider is at fault for the accident. For example, they may have been intoxicated, swerved and crashed into a car. To prove fault, you must have evidence that the other party was not careful and their actions caused the victim’s injuries. Don’t hesitate to contact the personal injury attorney of Waitz & Downer today if you have any questions about your motorcycle accident, or if you need expert help on your case!